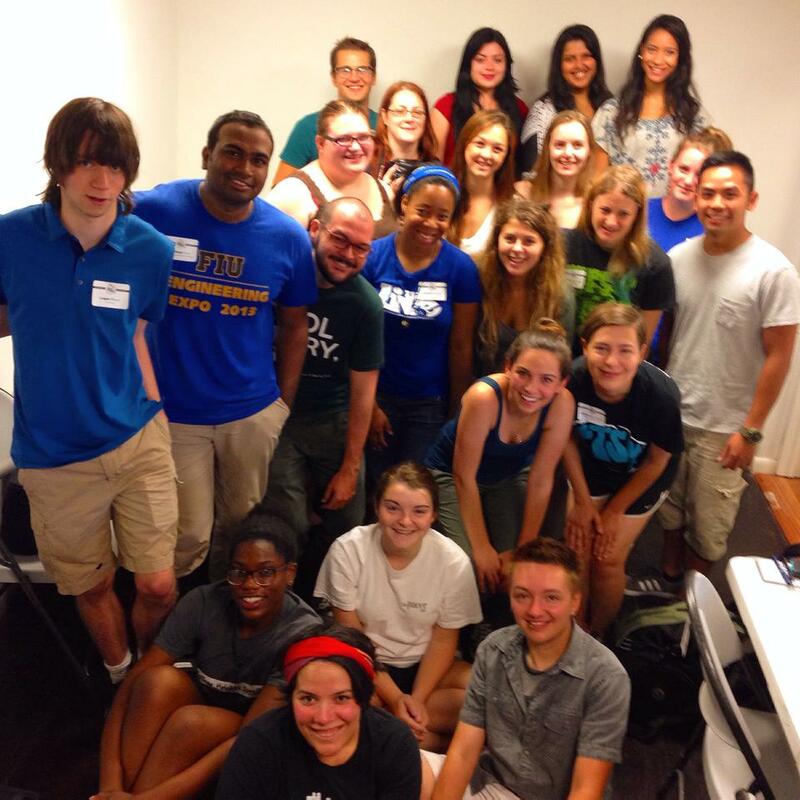 All of the college students who were a part of the Will Work for Food 2014 program. It’s called Will Write for Food – a program where 20 college students take over the nation’s second-largest homeless newspaper and assemble an entire 24-page issue in 36 hours. The website doesn’t sugarcoat anything, from the dinner at the shelter to the lack of sleep. That was the reason why journalism student Ashley Stewart wanted to apply. She had just written an article about a church group that holds art classes for people with disabilities – many of them having experienced homelessness at one point in their lives. It was there that she met a woman who was a Real Change vendor with a tough upbringing. Stewart became the only student from Washington to be accepted into the program located in Florida since its inception six years ago. Jetlagged, she arrived at the homeless shelter, formerly an hourly motel, and had dinner with the residents. Stewart would spend the next 36 hours in a makeshift newsroom to the side of the shelter, which is privately-run and accepts those who cannot stay at public shelters due to drug problems, mental illness, or other behavioral issues. Stewart decided to write about Section 8 of the Housing Act of 1937, specifically the Housing Choice Voucher Program which pays a large portion of the rents and utilities of about 2.1 million households. One woman had lived in Ohio, but got her Section 8 voucher transferred to Florida because she thought she was going to have an apartment. Instead, she had been at the homeless shelter for eight weeks. “She told me she was stuck in a permanent state of hypnosis, but the doctors say she has schizophrenia,” Stewart said. After writing the story, Stewart went to take a photo of the woman. Her eyes were red and puffy due to lice soap getting in her eyes earlier that day. Stewart said that the experience made her think about whether the program was ethical. Stewart was forced to weigh the value of stories and realized that, for her, the program was more about the experience than getting clips. Read Stewart’s article, along with the entire issue of The Homeless Voice.